When Apple unveiled the Apple Watch Series 4 earlier this month, Fall Detection was one of the biggest highlights of the device. It uses the improved accelerometer, gyroscope, and software algorithms to detect when you suffer a hard fall. It then sends you a notification that you can use to make a 911 call or dismiss it. If you remain immobile for about 60 seconds after the hard fall, the device will automatically call 911 and notify your emergency contacts along with your location. Why is Fall Detection turned off by default? Don’t try to deliberately fall over on a hard surface just to test the Fall Detection feature because it’s turned off for most users by default. Apple didn’t highlight it during the keynote event. But it is enabled only for people aging 65 or older when they set up the Apple Watch and the iOS Health app. For everyone else, Fall Detection is disabled by default. The fact that it is disabled by default for most users was first reported by Reddit user No1ARSoul. If your age in the Watch or iOS Health app is not set or set below 65, you have to enable Fall Detection manually. Here’s how to do it. If you want to disable it, follow the same process as above and toggle off Fall Detection. It is automatically turned on for users aged 65 or older. Apple says in its Support document that when the Apple Watch Series 4 detects a “significant, hard fall,” it displays an alert, sounds an alarm, and taps you on the wrist. The alert includes three different options, one of them being “Emergency SOS” to contact emergency services. It will wait for a response if you are moving. If you are immobile for a minute, it will launch a 15-second countdown before automatically calling 911 and messaging your emergency contacts. The Cupertino company collected data from thousands of people to create the Fall Detection algorithms. The feature can detect both the front-facing falls and backward-facing slips. However, there is a possibility of false positives for active people, and many of them would want to keep the feature disabled. 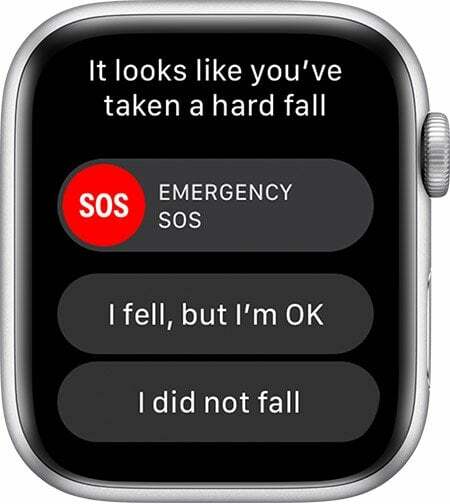 Since the Apple Watch Series 4 debut, many YouTube channels have tested the Fall Detection feature to find out how hard of a fall it requires to trigger an alert. A video from the YouTube channel What’s Inside shows that falling onto soft surfaces such as carpet, gymnastics mat, foam pit, and trampoline doesn’t trigger the alert. The Apple Watch Series 4 offers significantly better results if you fall on the floor. Apple’s algorithms base the alert on impact. It doesn’t count falling on softer surfaces as hard falls. Anyway, the test shows that the device doesn’t always detect hard falls accurately. There is some margin of error that you should keep in mind. The iPhone maker is positioning the Apple Watch Series 4 as your go-to fitness tracking device. Apple COO Jeff Williams said during the keynote event that the Series 4 would be your “indispensable communication and fitness companion.” It has a built-in Electrocardiogram (ECG) that can detect if your heart is beating normally or you have symptoms of Atrial Fibrillation (AFib). It will prove useful to people worried about their heart health. The Apple Watch Series 4 comes in 40mm and 44mm sizes with thinner bezels, making its display 30% bigger than the Series 3. Its speaker is also 50% louder than the Series 3. It sports an improved 64-bit dual-core S4 processor, which is twice as fast as the S3 chip inside the Apple Watch Series 3. However, its battery life remains similar to Series 3. The battery life remains similar to last year’s model. The Apple Watch Series 4 is priced at $399 for the GPS version. The GPS + Cellular model is going to cost you $499. If you can’t afford it, the tech giant has slashed the prices of Apple Watch Series 3 to just $279.